Grams Performance Fuel Injector Kit MAZDA - MiataRoadster - Stay tuned with MiataRoadster! Grams Performance is proud to offer the most innovative high-performance fuel injectors for today’s performance vehicles. 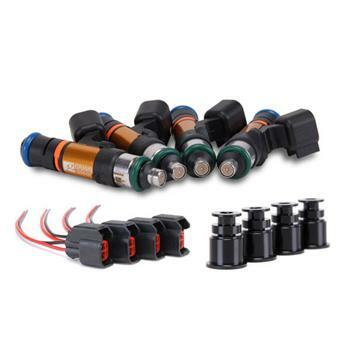 Premium materials, advanced manufacturing techniques and stringent quality control procedures mak Gram Performance the leader in high-performance fuel injectors. An engines’s fuel injectors perform a vital role in the accurate metering and atomization of fuel. Grams Performance accomplishes this with its high-impedance Bosch Motorsports EV14 fuel injectors that are modified for high-performance use. Each injector is individually balanced, flow tested and dynamically matched for characterization within one percent of each other. To ensure leak-free operation and optimal performance, each injector is then pressure tested up to 220 psi. The results are unmatched cylinder-to-cylinder consistency, even at low pulse width’s, as well as optimal idle quality, response and performance. Grams Performance Fuel Injectors’ ultra-fast and precise solenoids feature a linear response curve across a wide range of operating conditions and can accurately meter fuel even at the highest pressures and shortest pulse widths. The EV14 injector’s superior ball/pintle valves combine with Grams Performance’s precision-modified nozzles allow for consistent performance up to 118 psi, making them suitable for a wide range of applications, yet without exhibiting any of the high-pressure problems often associated with other injectors. The optimized spray pattern aso helps improve mixture preparation as well as atomization. Grams Performance injectors are cold-cut with diamond grinders in less than three seconds for high performance with “pre-seating”. Abrasive cutting creates heat, which leads to poor spray patterns and the need for competitors to pre-seat their injectors to reduce distortion. Each injector is also fitted with high-quality Viton O-rings that are resistant to extreme temperatures and harmful oils found in some fuels. Each injector set includes dead time compensation values to help ensure consistent air/fuel ratios and optimal performance when tuning. Grams Performance Fuel Injectors are carefully tested and matched in controlled laboratory environments using state-of-the-art equipment and are subjected to rigorous dyno, street and race track testing to ensure proper performance in the most extreme conditions.